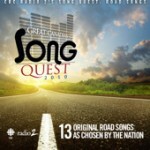 I’m thrilled to have some really lovely songs from the CBC Song Quest project. Manitoba’s Kerri Latimer is featured with a song I’m an instant fan of called ‘Mountain Road’. Visit cbc.ca/radio2/songquest/ for more information.